I’ve had a long relationship with Charlotte Brontë’s Jane Eyre. It began when I was pretty young – nine or ten, I think – and found it on the shelf above my bed in the room I always used when I visited my grandparents over the summer. I remember reading it during a wild summer storm, and rereading it again several years later. It’s one of those novels I go back to, every so often, finding something new in it with every visit, as if it’s the book that’s changing, instead of me. When I was offered the chance to review this anthology of short stories, all by women, inspired by Jane Eyre’s iconic line, “Reader, I married him,” I knew I had to read this book. It’s a funny thing. I write short stories, but I don’t often read them any more. So first, this book reminded me that short stories are a great way to sample the work of a new author, or at least, an author who is new to me. The stories in this anthology range from close interpretations (Grace Poole’s version of the story is especially poignant) to stories that only have unconventional marriages, or vague hand-waving in Jane’s direction to connect them with the original work. “Dangerous Dog,” by Kirsty Gunn – a woman saves a dog and introduces would-be bullies to the joys of Jane. “Reader, I Married Him,” by Susan Hill – about a rather famous unconventional marriage involving an American divorcee and an abdicating ruler. “The Mirror,” by Francine Prose – a dark look at what happens in Jane and Rochester’s marriage after the novel ends. A concise, compelling, psychological thriller. “Dorset Gap,” by Tracy Chevalier, who edited the anthology – Ed and Jenn met at a rave the night before, and now they’re on a hike. “The Orphan Exchange,” by Audrey Niffenegger – re-sets the novel in a contemporary, albeit war-torn, country, with an ending that I’ve always suspected was a possibility. 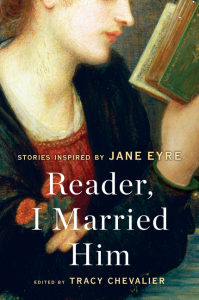 But those five stories are only a representative sample… this collection looks at marriage from so many angles, and uses Jane Eyre as the connecting tissue, even if sometimes it’s not obvious. What I loved is that each of these twenty-one tales was written by a woman, and each was completely relevant to modern readers, in a way the Brontë sisters’ work was to their contemporaries. As well, I’m tickled that there was diversity – older women, young girls, gay men, and lesbians, several religions, and many cultures (including one story about an Argentian-raised Korean woman in New York) were represented. What I didn’t love is that there were only twenty-one stories. I’d love to see more. I’d love to see an annual contest sort of like the Strange New Worlds contest that used to be run every year for Star Trek fans, where aspiring writers could write their own short stories inspired by Jane. Still, if the worst thing you can say about a book is that it left you wanting more, I think the author – or authors, in this case – has done their job. Whether Jane Eyre was a literary companion of your childhood, or you met her later in life, there’s something for you in this collection, Reader, I Married Him. Goes well with, a proper English tea, or a bowl of venison stew served near a crackling fire on a cold and rainy day.